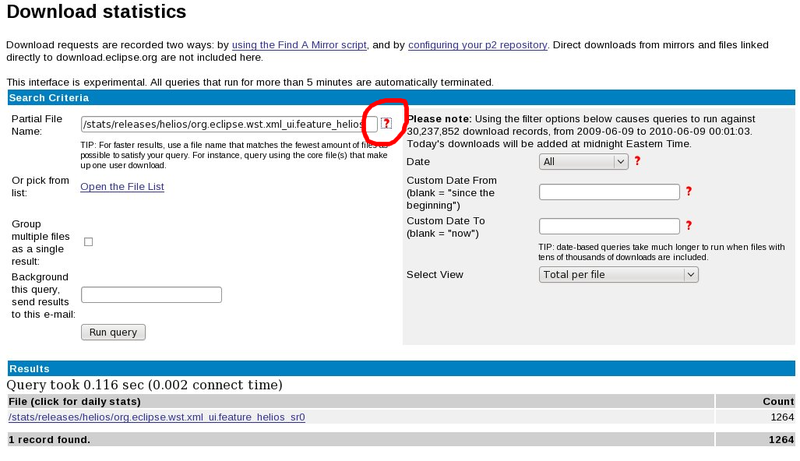 where /path/to/file.zip is the path relative to download.eclipse.org. When a user picks a mirror site, the download request is automatically logged. Log into the MyFoundation portal, and use the [tools] for all Committers option of the Eclipse Projects portlet. Enter a partial filename to search for, relative to the downloads area. The broader the search, the longer it will take to return results, so try to identify the core files that make up one user download. Use the % (percentage) as a wildcard to substitute multiple characters, or the _ (underscore) wildcard to substitute one character. You don't need to use % at the beginning or the end. If you need suggestions for your download stats, please contact the webmaster.